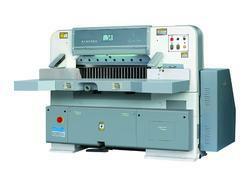 Our product range includes a wide range of paper cutting machine and paper board making machine. Paper Cutting Machine, We follow strict quality strategy, guidelines and thus, to sustain good quality standards, we carry out stern examination of the raw inputs used at the initial stages. Our product is packed in industrial grade packages that are recyclable and provide protection to the products from physical and chemical damage. Additionally, the product is properly labeled to provide information. We are leading manufacturer and supplier of Paper Board Making Machine.